The fin trade is a major driver of shark over exploitation globally. Shark fins are one of the most expensive seafood commodities on the market, estimated to be worth USD $400-$550 million annually. Despite documented population declines for several species worldwide, prior to 2013, there were no international trade controls for commercially important shark species traded in large numbers primarily for their fins and meat. Sharks are now considered some of the cornerstone species of the Convention on International Trade in Endangered Species of Wild Fauna and Flora (CITES). The shark species highlighted in the shark fin ID field guide have been listed in Appendix II of the Convention, meaning that governments around the world agreed that the trade in these species must be closely monitored and regulated to prevent them from being pushed closer to extinction. These species are common in international trade due to the high value of their fins, which collectively make up a significant proportion of the market. Since 2012, over 500 officials from dozens of countries have been trained on how to use this guide, and it continues to be an important tool for officials to visually distinguish fins from CITES listed sharks amongst fins of non- CITES listed species during routine inspections. The ability to quickly and reliably identify CITES Appendix II listed shark species using visual characteristics coupled with more targeted genetic screening provides governments with the means to successfully implement and enforce the CITES shark listings and promote legal, sustainable international trade. 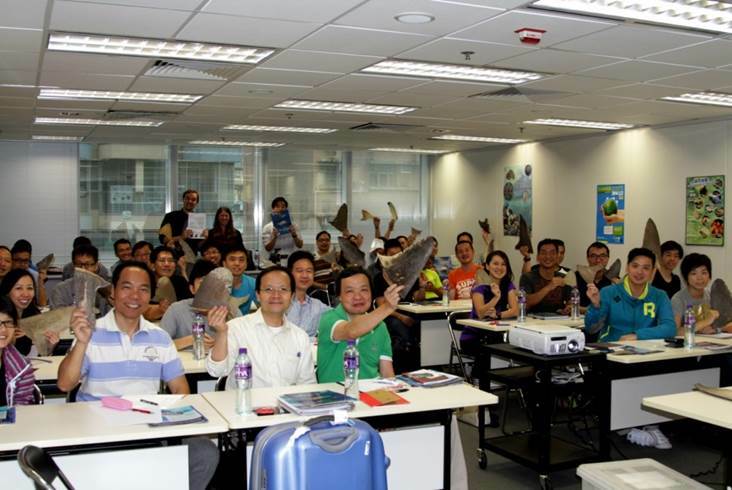 A number of fin identification workshops have been held with officers from Hong Kong focusing. As a result the Agriculture, Fisheries, and Conservation Department (AFCD) in Hong Kong, SAR has confiscated just over 5 metric tons of fins based on preliminary visual identification since November 2014. This field guide is based on data collected during the examination of more than 2,000 dorsal and pectoral fins from over 60 shark, ray and chimaeras species, including all the dominant species or species groups in the international fin trade reported in Clarke et al. (2006). Conspicuous fin markings were also assessed for pattern and consistency within species using photographs published in the literature and online. Fins used in this study originated from the United States, South Africa, Belize, Costa Rica, Chile, Colombia, Fiji, New Zealand and Sri Lanka, and Hong Kong, SAR, and included a wide size range for each species. Fins examined in this study were provided by fishermen, fin traders, and scientists. No sharks were sacrificed for this project. This work was supported by The Pew Charitable Trusts and compiled by Debra Abercrombie, with assistance from the following researchers: Sebastian Hernandez, Diego Cardenosa, Rima Jabado, Lisa Natanson, Sabine Wintner, John Carlson, Simon Gulak, Clinton Duffy, Doug Adams, Kevin Feldheim, Andrew Fields, and Stan Shea. We would also like to thank the Kwa-Zulu Natal Sharks Board, the New Zealand Department of Conservation, the Fiji Department of Fisheries, the US National Marine Fisheries Service, the Florida Fish and Wildlife Conservation Commission, and the Belize Department of Fisheries for assistance. This guide synthesizes and builds upon two previous guides: “Identifying Shark Fins: Oceanic Whitetip, Porbeagle, and Hammerheads” and “Identifying Shark Fins: Silky and Thresher”, compiled by Debra Abercrombie and Demian Chapman.